This year's drive collected 26,720 pounds of food and $27,217.30 in cash donations. Thank you Parksville! The first food drive was held in 1997 in Qualicum Beach and Parksville Fire Rescue joined in 1998. 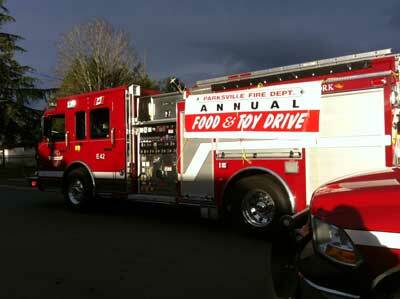 The annual food and toy drive is conducted over a weekend in November by firefighters from departments in District 69. Parksville members and volunteers go door to door throughout Parksville and the areas served by the Parksville Fire Protection Area. Members try to get to every houseline and if an addressed is missed, donations will be collected during the weekend at the Parksville firehall. Donations of non-perishable food items, unwrapped toys and cash collected are for the Salvation Army. 1998	The first food and toy drive for the Parksville Volunteer Fire Department food was held to help stock the Salvation Army’s shelves for Christmas. In the inaugural year, 5,000 pounds of food were collected. 1999	Organized by members Scott Baillie, Dave Urquhart and John Mentanko, 9,200 pounds of food collected. 2000	12,182 pounds of food collected with the bulk of the donations used for Christmas hampers at the SOS and the remaining contributions used in the food bank and soup kitchen. 2002	11,000 pounds of food collected by PVFD. 2003	10,000 pounds of food collected by PVFD. 2004	10,500 pounds of food collected by PVFD. The Salvation Army was able to provide 600 Christmas hampers helping over 1,400 men, women and children in the community. 2005	9,500 pounds of food collected by PVFD. 2006	10,000 pounds of food collected by PVFD. 2007	16,860 pounds of food collected by PVFD, a significant increase in donations and the best year to date. The Salvation Army Church kindly donated breakfast for members volunteering to collect donations door to door. This has now become an annual tradition. 2008	17,229 pounds of food collected by PVFD. Arrowsmith Search & Rescue joined the event. 2009	23,000 pounds of food collected by PVFD and a new record. 2011	18,300 pounds collected by PVFD. After being the Parksville food and toy drive coordinator for about ten years, Scott Baillie passed the role to Liz Olson. 2012	21,080 pounds collected by PVFD. This was the first year Craig Bay Residents Association did their own collection as part of the PVFD food drive, collecting in excess of 3,000 pounds of food. 2013	25,500 pounds of food collected by PVFD. Cash donations were significant this year, $4,500. 2014	23,300 pounds of food collected by PVFD and cash donations increased to $ 5,000. 2015	A record year with 27,000 pounds of food and cash donations of $10,525. The cash donations go a long way to stocking shelves at the Salvation Army food bank. Quality Foods has been a huge supporter of the food drive since its inception doubled the value of the cash in-store when the food bank purchases food at their stores with the donated cash. 2017	By far the most successful food and toy drive in PVFD history with 38,870 pounds of food and $21,000 in cash. The efforts over the past three years to get stratas and apartments involved proved to be instrumental to the increasing success. 2018	This year's Food and Toy Drive was once again a tremendous success with 26,720 pounds of food collected and $27,217.30 in cash donations. This year marks twenty years of helping local families in need.